Hi friends! 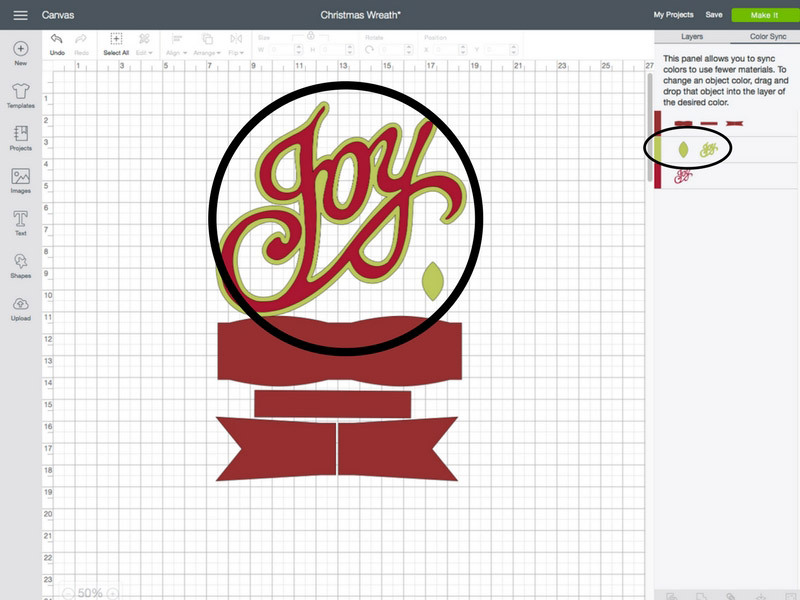 Jenny from Everyday Jenny here, and today I’m sharing a tutorial using the Cricut Maker to create this custom holiday wreath. There are so many fun Cricut materials you can use to add a variety of colors and textures to your holiday wreath. I used Cricut Felt, Faux Leather and Sparkle Paper. The Sparkle Paper may be my new favorite material. It’s so shiny and colorful, and I love the sturdiness of it. 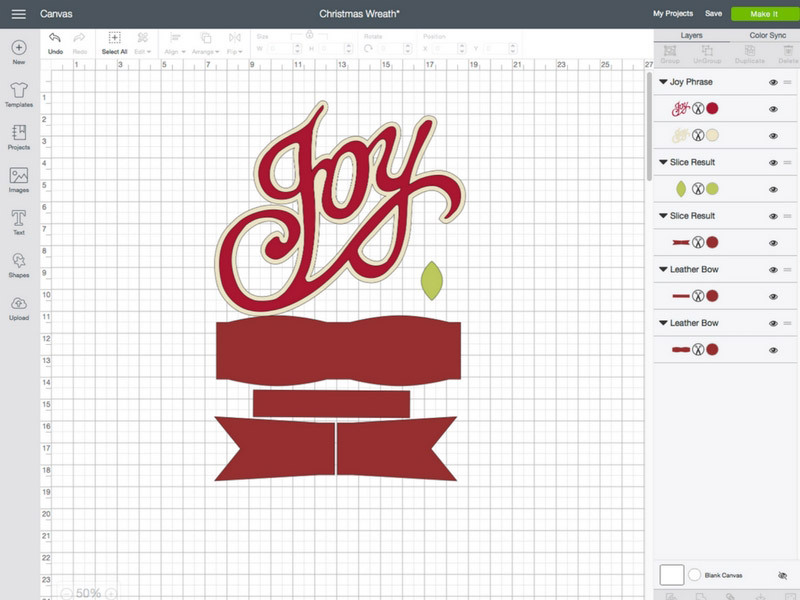 What’s your favorite Cricut material? Separating your materials on to different mats is easy in Design Space. 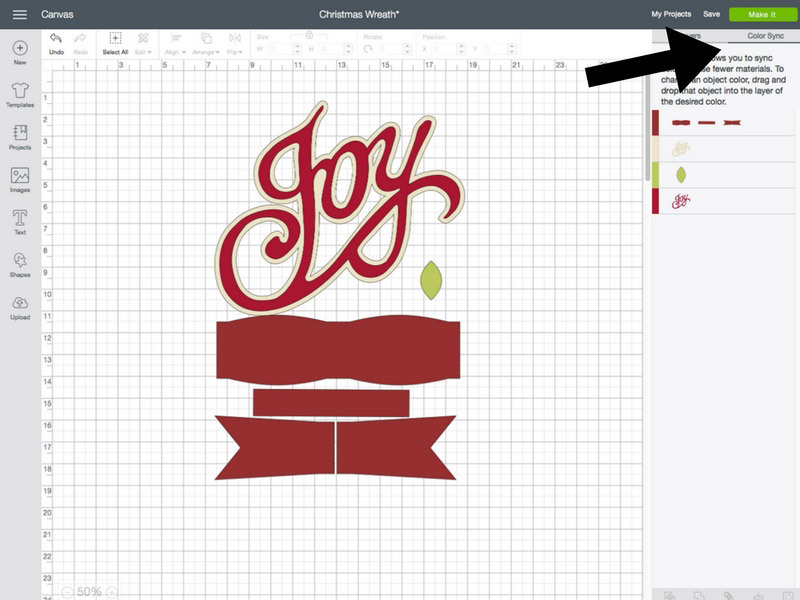 When you create your design, different colored layers are automatically sorted on to separate mats. I will show you how you can easily change the layer color and how you change the type of material for each mat. If you want an image to cut on the same mat as another image you can make them both the same color using the Color Sync tool. The Color Sync tool is in the upper right-hand corner of the design screen. When you click on it you will see all the different colors you are using. To change an image to another color simply drag the image to the desired color. For example, I changed the “Joy” background to green on the Color Sync menu and you can see it changed it on the design screen. 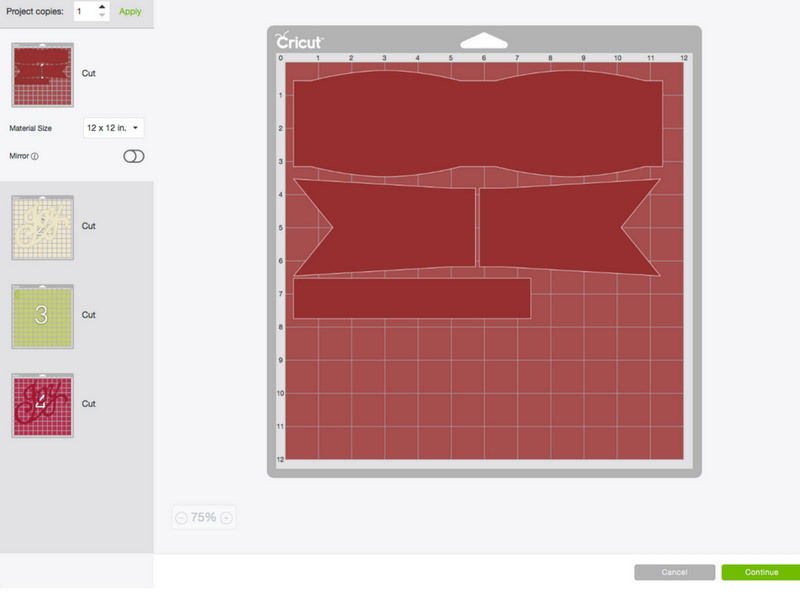 When you click on “Make It” you will see that Design Space automatically separates the layers on to individual mats. On this screen, you can edit the image placement on the mats by clicking on each mat and dragging the cuts to a desired place on the mat. Where they appear on the mat preview is where they will be cut on your mat. You can also change your material size if your material is smaller or larger. Lastly, you can select the number of project copies and you can also mirror your image if needed. 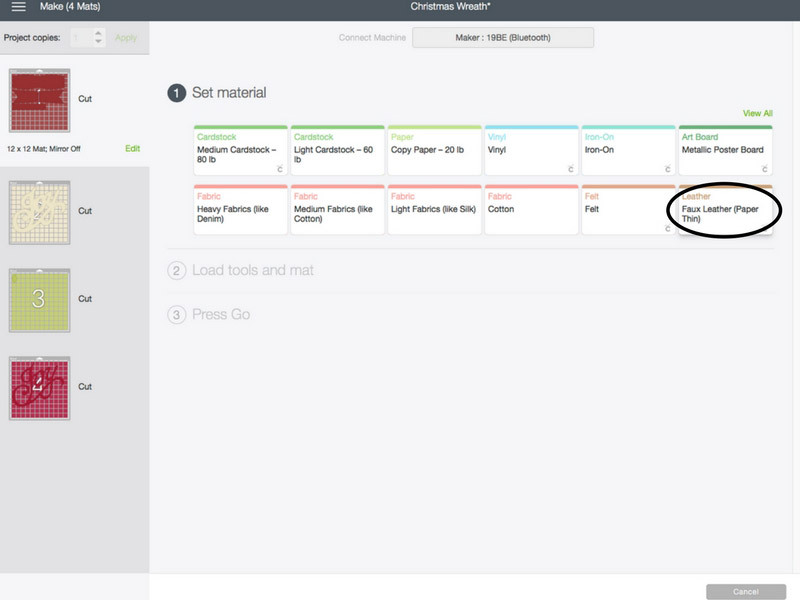 Click on “Continue” and you will be prompted to select your material for the highlighted mat. Since the first mat is the bow, you will select faux leather and cut it out. Once you have cut out your first mat, you can then select a new material for the next mat. Simply click on the material name in step one and select either from the shortcuts shown or click on “View All” to see all the materials. You will change the material for each mat until all of your materials are cut out. Now you are ready to assemble your wreath! I will go over assembly and types of glues for each material in my next post. Be sure to check it out tomorrow! 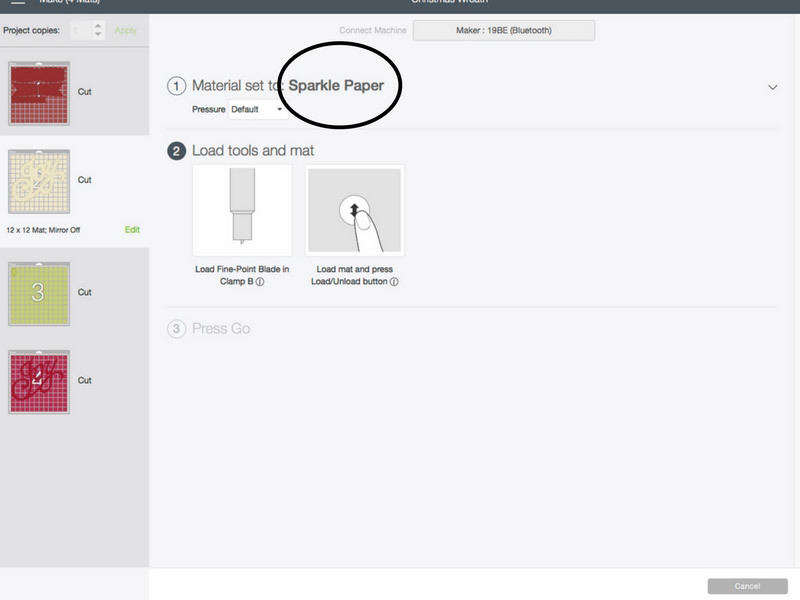 What materials have you tried cutting with your Cricut Maker? Tell me in the comments below! Uploading Images on iOS is Here! What sorts of crafts do you like to do and what is your budget? If you want to do fabric, try the Maker. It can cut many different kinds in additional to a wide variety of other materials. The Explore series also does well at cutting many things. Fabric needs to be bonded for those machines.